Exquisite Long Shadows - Write for Wine: It's Wine O'Clock Somewhere!Write for Wine: It's Wine O'Clock Somewhere! Washington state wine industry pioneer Allan Shoup created Long Shadows in 2003 to build the reputation of the wine region. To do so, he gathered some of the finest winemakers worldwide to make their regions’ wines, using Washington grapes. Since the beginning, Gilles has overseen the winery operations, in addition to creating Chester-Kidder, a tasty Cabernet Sauvignon/Syrah blend. He now also crafts the classic Poet’s Leap Riesling, rich Saggi (Sangiovese/Cabernet Sauvignon) and Julia’s Dazzle Rosé. Over the years, we have tasted Long Shadows wines at wine events such as Taste Washington and Auction of Washington Wines, and later at their Woodinville tasting room. 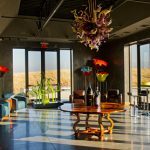 But this was the first time we visited the stunning Chihuly tasting room in Walla Walla. Showcasing spectacular glass art by Dale Chihuly, the beautiful space is a peaceful sanctuary to savor Long Shadows’ excellent wines. Large windows offer expansive views and also provide a look at the production facility downstairs. The Walla Walla winery is by reservation only, although they try their best to accommodate people who stop by unexpectedly. Here are the wines that we tasted with Gilles in the Chihuly tasting room. Because of Poet’s Leap, Riesling moved up higher on our list of preferred white wines. A classic Washington Riesling, this is dry and pretty, with layered flavors of grapefruit, lime, tangerine and peach, complemented by a refreshing minerality. This vintage is rosé of Pinot Gris, and is simply delightful, with notes of melon and citrus, finishing clean and refreshing. Named after Shoup’s granddaughter, Julia’s Dazzle features a bottle that is as beautiful as the wine. It pairs perfectly with warm weather, or with seafood, shellfish and Asian dishes all year round. This is one serious Merlot. The full-bodied Pedestal opens with aromatics of spice and red fruit, leading to intense, rich fruit flavors of blueberries, plum, cedar and more spice. I’m sure I’m not the only one who did an actual pirouette when tasting this blend. Opulent, voluptuous and concentrated, this layered, velvety wine offers dark fruit, dark chocolate and graphite flavors. We’ve always been fans of Gilles’ new world Bordeaux blend, named for Shoup’s grandfather, Charles Chester, and grandmother, Maggie Kidder. Cabernet Sauvignon (60%) is blended with Syrah (25%) and Petit Verdot (15%). This complex wine opens with aromas of dried figs, blackberries and cocoa, and followed by layers of flavors of dark cherry, blueberry jam, sweet spice, and hints of earth and smoke. Winemaker John Duval, well known for his production of Australia’s Penfolds Grange, chose Washington State’s Columbia Valley as his “Sequel.” This is a gorgeous concentrated wine with notes of red fruits, dark chocolate, cassis and a touch of smoke. In conclusion, we highly recommend this stellar, unique Washington state wine winery. So, if you live near or visit Walla Walla or Woodinville, be sure to stop by Long Shadows tasting room. Locations, times and prices are listed on their website. Thank you, Gilles, for the lovely afternoon tasting through Long Shadows wines. This entry was posted in Bordeaux Blend, Cabernet Sauvignon, Columbia Valley, Merlot, Petit Verdot, Pinot Gris, Riesling, Sangiovese, Syrah, Walla Walla, Washington, Wine, Woodinville and tagged Bordeaux blend, Cabernet Sauvignon, Long Shadows, Merlot, Petit Verdot, Syrah, Walla Walla, Washington wine, Washington wineries, wine, wineries, Woodinville by Margot. Bookmark the permalink.